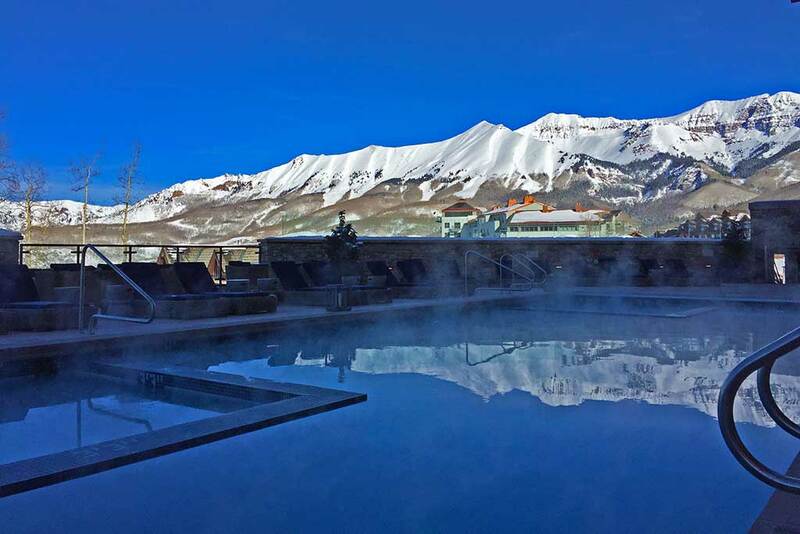 The new sky terrace with heated pool and hot tubs at the Hotel Madeline raises the bar in Telluride's outdoor pool scene. The pool is accompanied by hot tubs, and numerous fire pits. Sun-umbrella tables complete with cushioned oversized chairs, chaise lounges, food and beverage service create the ultimate atmosphere to relax and enjoy the surrounding San Juan mountains. Telluride's legendary sunsets over Mount Wilson accompanied by the best cocktails from the M Club are even more memorable when experience from the sky terrace. The pool and terrace open at 7 am each morning for lap swim and then at 9 am the facilities are open for everyone's enjoyment. All of the Hotel Madeline's food and beverage services are available on deck. Watch the skiers and boards ride by on the Chondola lift while frolicking in the warm waters of the pool and hot tubs. Young and old alike will find the experience incomparable to anything else Telluride has to offer making the real estate properties at the Madeline Residences a very special opportunity indeed. With only eight penthouse at Madeline Residences, the three new units recently offered for sale include a 2 bedroom, 3 bedroom and a 4 bedroom option. Offered at $3,300,000, Penthouse 706 features 4 bedrooms plus an office/flex room and 4.5 baths at 3,972 square feet of living space on two levels. Facing west with an expansive deck and panoramic mountain views, 3 master suites and a children's bunk room this condominium lives like a home. Madeline Penthouse 705, offered at $2,100,000 encompasses 2,293 square feet of living space with vaulted ceilings in every room. This premium 3 bedroom, 3.5 bath condominium has 2 master suites and children's bunk room (which could function as a third master suite, if desired) with beautiful deck featuring in-your-face views of the St. Sophia mountain range. Madeline Penthouse 708 is a rare fine top floor two bedroom,2.5 bath unit offered at $1,375,000 with 1,786 square feet of exception living space. With a very functional floor plan and views overlooking Misty Maiden ski run this is a must see for any two bedroom condo purchasers. With an oversized master suite and deck sunrises could be any better than those enjoyed with your morning coffee from this spectacular unit. If you are considering a condominium purchase in the Telluride area or Mountain Village specifically, be sure to ask me about the Madeline Residences in the core of Mountain Village, Colorado!